Jonathan Demme, whose immortality was assured with The Silence of the Lambs, has taken to remaking the classics. Two years ago, The Truth about Charlie didn’t live up to Charade. This year, The Manchurian Candidate does slightly better, but still doesn’t live up to its predecessor. Set in the summer of 2004, during the Democratic National Convention, The Manchurian Candidate skirts awfully close to reality. Behind the fictional characters you can see the likes of Al Franken, offering droning political analysis on these “fictional” events. Against this backdrop of realism is a fantastic story of brainwashing and electronic implants. Two Gulf War veterans figure prominently in the story. 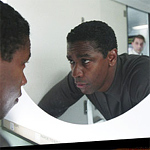 One is Ben Marco (Denzel Washington), a simple man with a simple life. He’s a mid-level officer, the kind who speaks to boy scouts about serving in the armed forces. The other is Raymond Prentiss Shaw (Liev Schreiber), born into a political dynasty with a silver spoon in his mouth. His one act of rebellion against his mother’s (Meryl Streep) grand plans for him was to enlist in the Army. Marco and Shaw served together in the Gulf War, and haven’t seen each other since. But after Marco runs into another buddy, Melvin (Jeffrey Wright), disturbing images start appearing on his mindscreen. Melvin is half-mad from the same visions, filling notebooks and wall space with graphic sketches and raving prose before he commits suicide. Marco seeks out Shaw to try to figure out what these memories (or are they fantasies?) mean. If Shaw is a little hard to reach these days, it’s because he was just chosen as the vice-presidential nominee for his party’s ticket. The first Manchurian Candidate was more of a mystery, with more of a surprise ending. Demme assumes we are familiar with that story and lets us in on the secret earlier in the movie. In Demme’s film, the tension comes from uncovering the who and the why, and not the what. As in a murder mystery, Marco starts tracking down clues. Something happened that night Shaw saved all their lives, but Marco can’t put his finger on it. With the help of a new friend, Rosie (Kimberly Elise), and an old friend, Richard (Bruno Ganz, channeling Gene Hackman’s Harry Caul), Marco resolves to reveal the real story. Some other things have changed since 1962 as well. The villains are no longer the communists, they are now multinational corporations. Manchurian Global, Inc., is basically Halliburton; it’s a company with lots of political power, through financing deals, government contracts, and insider connections (see also this summer’s The Corporation and Fahrenheit 9/11). The Manchurian Candidate is both good and bad. Just when you think Demme has lost it, a brilliant moment of cinematography, lighting, or acting appears. An opening scene of guys playing poker does nothing to advance the story and isn’t even that interesting to watch. But soon, Demme’s graceful, omnipotent camera pulls a gorgeous move: sneaking up behind Marco at the grocery store and peeking at what he’s buying: cup-o-noodles and plenty of No-Doz. Later, a change in lighting reveals an important change in perspective for Shaw; a simple trick that works well, proving that Demme is a director who knows what’s in his toolkit. The movie has some very good performances. Schreiber stands out as a clean-cut, well-meaning politician trapped between his power-conscious handlers and his paranoid-sounding Army buddy. Washington has an outstanding moment late in the film when he starts to go a little mad. It’s too bad Demme didn’t give Washington more screen time, or the scene more weight. Meryl Streep looks comfortable and confident in the shoes left by Angela Lansbury from the first film; some have called her Hillary-esque, which says more about the sexist views of politicians than Streep’s actual performance. Maybe the biggest mistake in this remake is the political story. The reference to real politics in this paranoid fantasy is often distracting and demeaning. As a back story, the politics are necessarily shallow, which belittles the real process and distracts from the story. So The Manchurian Candidate is a mixed bag. It duplicates a movie that didn’t require a remake, and it doesn’t always make the smartest choices. Then again, compared to The Truth About Charlie, it’s is a step in the right direction for Demme.